The rice used for a traditional Goan meal is the Goan par boiled rice. This par boiled rice is unpolished & has a reddish brown color & is also known as red rice. 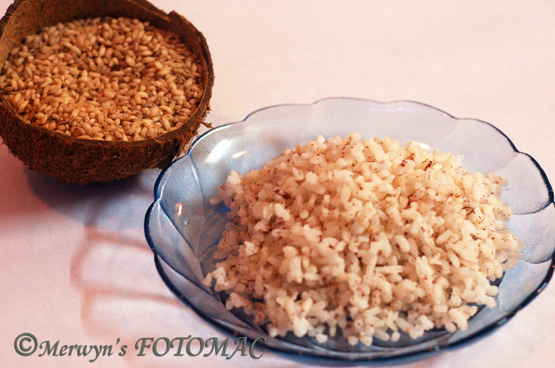 Goa rice is known as “Ukdem Tandul”. Ukdem means boiled & tandul means rice. Pick, winnow & wash the rice about 3 to 4 times. Soak the rice for about 30 mins. When the water comes to a rolling boil add the rice, salt & stir. Cook till the grains are soft. Test between your finger tips from time to time for doneness. Drain the water completely through a sieve. Serve the hot boiled rice with fish or prawn curry or any curry of your choice. Tip: Remember it takes quite a while for the rice to cook.